Beautiful arrangement. Delivered on time. Glad to know this service is avaiable. I will certainly be using Floral Impressions again. Thanks. Quick efficient service. Beatiful flowers delivered. A stunning bouquet delivered on time. I always use this florist because they have excellent service. Easy and reliable, just as described on the site. I've used Celine's both over the phone directly and through Direct2Florist and have been completely happy with the service on all occasions, even the busy times like Mother's Day, etc. Absolutely fantastic service. Delivered in 6 hours from ordering in a panic! The bouquet has received multiple favourable comments and praise as "The Best Yet" (I buy many bouquets online for delivery). If there is any downside - I thought the price a little steep but the service was incredible and I didn't let the price interfere with the rating as a result. Definitely a 5* service. I'll be back for more. Beautiful flowers delivered. My mother was very happy with them. Thanks! Stunning arrangement, even better than photos, highly recommend! 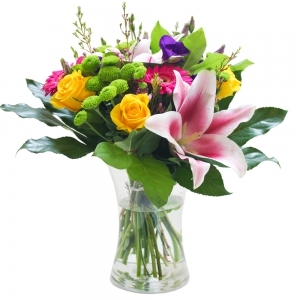 A graceful host of our finest flowers and greenery, encased in an elegant glass vase. Gift them with sophistication with a floral creation designed by experts, hand-crafted and delivered in style. Perfect for all occasions.